In 2017, Liberty Bank delivered results that were nothing short of outstanding. Celebrating 192 years of service to our communities, we are the state’s oldest Bank and the fourth largest in Connecticut. We have grown to more than $4.7 billion in assets with a net income of more than $40 million last year. Capital levels increased by $55 million with strong earnings and our Foundation celebrated 20 years of service to our neighbors. Our financial performance was not our only “best” in 2017, the Hartford Courant also named Liberty ‘best of the best’ as the #1 Large Employer in CT! 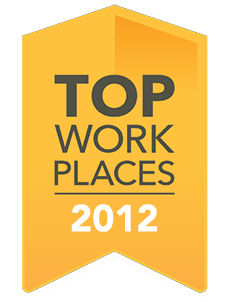 This was Liberty’s sixth straight Top Workplace Award. While focusing on the things we do best - like personal and business banking, commercial and residential lending, and investment services - is key to our success, there’s so much more to it. What makes us unique is measuring our success not only in dollars, but by the number of lives we touch, the communities we help strengthen, and the investments we routinely make in our workforce. The Power of Collaboration: 700+ employees strong. We engage employees from every area of the Bank to help us think outside-of-the-box... to come up with the best solutions for improving our customers’ financial futures. We work toward a shared vision and common goals, keeping our customers best interests at the core of what we do. The Power of Commitment: 250,000+ customers and growing. We are passionate about delivering customer service that is second to none. Regardless of how you reach out to us, we want to be certain every experience is the best. At the end of 2017, you told us the wait time in our Customer Service Center was too long... well, we heard you. In the first few months of 2018, we increased staffing by 30% to improve our response time. We also continue to develop and introduce products and services that deliver real value to you and your families, products like our QuarterBack Checking, our no fee Health Savings Account, and our about-to-be released checking account designed especially for students! The Power of Community: The Liberty Bank Foundation + 700 caring, engaged employees is a winning combination! We never back down from opportunities to be a good neighbor. In fact, we go looking for them. Convening like-minded organizations to take on the toughest challenges facing our communities has become one of the hallmarks of our award winning Foundation. It’s never just about making grants or volunteering time, at Liberty it is always about working toward lasting solutions that help our neighbors build and sustain thriving communities. The Power of WE: None of the foregoing would be possible without every member of our team believing in and delivering on our core values. The dedication, focus and commitment required to build something as special as we have here at Liberty Bank can’t be taught, it comes from within. As we move forward in 2018, we will take additional steps toward our long-term vision of being the Most Admired Company in Connecticut. We will remain focused on the three things that got us where we are today: our customers, our communities and our employees. We will work even harder to deliver exceptional customer experiences; to help build even stronger communities: and to create an environment for our team that encourages and rewards determination, exploration, and innovation! We are also extremely excited to move to our brand new, 90,000 square-foot Corporate Headquarters set on 23 acres at 245 Long Hill Road in Middletown in 2018; quite possibly the most exciting employee transition in Liberty’s history! Supporting the community is ingrained in Liberty’s culture. It’s what Liberty stands for; it makes employees and customers proud to be part of this amazing organization. In 1935 Liberty Bank helped establish the Middlesex United Way and has been supporting it ever since. We have successfully grown donations through each campaign, putting tens of millions of dollars back into the Connecticut community. Last year alone over $169,000 was raised by employees plus a generous gift of $92,000 from Liberty Bank Foundation! Liberty Bank received an overall rating of ‘Outstanding’ from the State of Connecticut Department of Banking and the FDIC on its 2017 Community Reinvestment Act (CRA) exam for our commitment to support low-to-moderate income communities, specifically around the Waterbury, New Haven, New London, New Britain, Middletown, Meriden, Willimantic, Norwich, Hartford, and East Hartford areas. The Good Neighbor Program, First-Time Homebuyer Seminars, Affordable Lending Summits, Academy for Small Business, and numerous sponsorships to support our neighbors in need all contributed to this admirable recognition! LBIS Brian McLaughlin became the first LBIS Financial Advisor to break $1,000,000 in production and was placed on the Leader’s Council in RJFS for the first time in Liberty’s history. RJFS Financial Advisor Dwayne Stallings received Executive’s Council status for production; was named a RJFS Leader’s Circle Winner; and a Raymond James Asset Management Services Leader of Distinction. Both Brian and Dwayne were recognized in Bank Investment Consultant Magazine as one of the country’s top performing financial advisors! Trifecta Personal Bankers Esther Lewertow and Kimberly Pierce earned President’s Council recognition through Vantis Life, for the sixth and third years in a row. They also received Liberty’s Trifecta Award, recognizing holistic financial services expertise. Operational Risk is responsible for Liberty’s Enterprise Risk Management Program with input from all areas of the Bank. In addition, they focus on risk governance and monitoring programs on compliance/privacy, vendor management, information security, fraud detection, and physical security. The Fraud Intelligence Unit not only helped reduce fraud losses, they also educated employees and customers about emerging threats such as cyber security and tax season scams, and provided tips for banking when traveling. Liberty Bankers received more than 60 hours of training per employee in 2017! Topics focused on opportunities such as leadership development, management certification, diversity and inclusion, enhanced retail education, and hands-on learning for new Online and Mobile Banking platforms. At the same time, outstanding customer experience is rooted in the extraordinary effort of all employees! That’s why, even with six consecutive Top Workplace Awards and a #1 finish in 2017, Liberty didn’t rest on its laurels. Instead, Liberty launched an employee survey to solicit feedback on factors contributing to a work environment that both motivates and inspires everyone to pitch in. What did employees say? They want even more opportunities to innovate and to make decisions in the best interests of the Bank’s customers! Our Commercial Real Estate (CRE) group closed $420 million in loans, bringing their portfolio to a whopping $1.7 billion! One top contributor, Jennifer Rodriguez, Vice President, CRE Portfolio Administrator, was named a 2017 Woman of Fire by the Connecticut Bankers Association! A win, win for Small Businesses! Liberty’s Small Business Loan Center closed 255 loans totaling $29.5 million in 2017 - a record high! The team also introduced a brand new Small Business Express Program to streamline the application and process for commercial loan requests up to $50,000; and in the first quarter of 2017, Liberty was named Connecticut’s Lender of the Quarter by the U.S. Small Business Administration (SBA) then became the number five SBA lender by volume in the state for both 7a loans and 504 loans. Most recently, Business Mobile Banking and Mobile Check Deposit made their debuts, making it even easier for businesses to bank with Liberty! Liberty Bank Customer Service Center agents answered nearly 190,000 calls in 2017! That translates to over 14,600 calls per agent! Always eager to help, they are specialists in every phase of our business, regularly assisting small business owners and individuals with everything from balance inquiries and transaction histories to home equity applications and digital troubleshooting. In 2017, the Liberty Bank family continued to expand in many directions; opening 16,000 new personal checking accounts, 3,000 new business checking accounts both online and at 55 Branch locations throughout the central, eastern, western and shoreline areas of Connecticut. Not to mention, more than 1,700 customers opened Health Savings Accounts, a product new to Liberty in 2016, helping people cover out-of-pocket costs on future bumps and bruises! By year end, Liberty’s Retail Lending portfolio exceeded $1.25 billion! With laser focus on the overall customer experience, our Retail Lending team moved to a 100% paperless environment for loan origination and processing, they developed and implemented the secure delivery of electronic loan documents, implemented a file sharing platform allowing customers to upload documents; and successfully rolled out a streamlined loan review process, delivering credit decisions in as little as 48 hours. In addition, Liberty brought home the gold again at the Home Building Industry Awards (HOBI) not once, but twice, being named ‘Best in the State’ for our Construction to Permanent Loan product (20 years and counting!) and End Loan Package for a Community Bank - a full team effort from every area of the department! "My goal is to find financial solutions tailored to the specific needs of business owners. I enjoy helping them manage cash flow, save time and money, and discover new revenue stream opportunities." "I love working for Liberty! One of my favorite responsibilities is to build lasting relationships with my Small Business customers." Find your [control is at my fingertips] place. When it comes to efficiency and satisfying our customers’ on-the-go lifestyles, digital banking is first in line. Mobile Check Deposit - completely new for businesses. Debit Card Controls - allows you to control where, when and how your card is used! You can even set dollar amounts, set alerts, block transactions, and freeze and unfreeze your card from your mobile device if fraud is suspected. Liberty2Liberty - free, immediate transfers to other Liberty Bank customers. Send Money - a free way to pay any person via text or email. Money Manager - a Personal Financial Management tool. Liberty is a true community bank! They really care and will do whatever it takes to help local people and businesses succeed! Refreshingly pleasant and easy to work with; like I had a friend in the business! Somma Tool Company has been a Liberty Bank customer since 2008. Being a small family business, we appreciate the small town feeling Liberty provides. Their customer service is outstanding, and we know that we are not just a number with them. They care! TEAM commends Liberty Bank for their generous giving and partnerships that continue to build strong foundations for the economic mobility of many vulnerable individuals and families in our communities. Liberty Bank is at the forefront of TEAM’s efforts in addressing economic well-being, and their support is providing positive outcomes and making a difference. Liberty Bank has been a huge benefit to our business and helping us get to the next level. I am confident in their ability to continue with a strong relationship and grow our business even more. "I am so proud to work for Liberty because we not only meet customer needs, but we give back to local communities in more ways than one." "I specialize in fraud prevention and detection, and enjoy helping people learn more about ways to recover and avoid being victimized again in the future." Anything is possible with The Power of WE! Sure, 2017 had its fair share of challenges; rate wars, heightened competition and regulatory restrictions won’t go away anytime soon. Yet, year after year the Bank excels, getting better and better at balancing our strong financial performance with everyday realities. In 2017, Liberty Bank experienced its greatest financial year in Bank history! Our net operating income, or core earnings, exceeded $50 million, an increase of over 35% from 2016, and net earnings surpassed the $40 million mark for the first time. Total assets increased by over $200 million in 2017, driven by strong net new loan growth of over $150 million, including nearly $40 million in consumer real estate lending. With this success comes reward. Year after year, Liberty Bank never ceases to lose sight of our commitment to the communities where we do business and the people that help the Bank achieve such strong, remarkable results. Thanks to our outstanding financial performance in 2017, we provided an additional $650,000+ to our Foundation and allocated additional dollars to support employee development before the end of the year. No one person or organization can do it alone. As the Bank continues its forward focus on increasing efficiencies, everyone will benefit. Customers, surrounding communities and employees will grow stronger and discover even more opportunities to build their financial futures with confidence. "I joined the Liberty family after a Bank acquisition. Liberty made the transition super smooth and welcomed me with open arms! I am so grateful to work for such a caring company." Building collaboration, whether it’s to fund a project or implement one, is a hallmark of Liberty Bank Foundation. Peers regard the Foundation as a statewide leader in its grantmaking focus areas: education to support economic success, and affordable housing. But there is more than meets the eye. Over its two decades of grantmaking, the Foundation has evolved its approach, leveraging all of its assets-knowledge, relationships, influence, and people power-for the good of all. Over the last 20 years, thousands of low-income children have benefited from early literacy support, after-school tutoring and mentoring, college and career preparation, and youth employment programs supported by Foundation grants. Opportunities have been opened for their parents as well through job skills training, adult literacy, parent leadership training, and financial education. In housing, grants have provided technical support and construction funding for affordable housing-and, perhaps most vital, community education to build grassroots consensus that affordable housing is necessary for healthy communities. In addition, the Foundation’s funding aids the statewide movement to build systems to end homelessness. Since 2013, homelessness in Connecticut has dropped by 64%, an especially proud feat to say the least. "Working at Liberty is like working among family. Being surrounded by colleagues who are excited to band together to give back makes it a pleasure to come to work each day." Affordable Housing: Middlesex Habitat for Humanity of CT, Inc. In 2017, New Haven-based Columbus House awarded the John S. Martinez Community Service Award to Liberty Bank Foundation. The annual award recognizes those that exemplify community leadership and outstanding support for the nonprofit’s programs, which provide solutions for ending homelessness in Hartford, Middlesex, New Haven, and New London counties. Last year, forty local Rotary Clubs teamed up with Liberty’s 55 branches to raise more than $288,000 during the annual Thanksgiving Drive! Liberty Bank Foundation matched with 25 cents on the dollar, making the total over $357,000, which was distributed among local food pantries and human service organizations. Over the 14-year history of the drive, more than $2 million has been raised to feed hungry neighbors. 182 employees pitched in for the second annual Liberty Lends a Hand in June 2017, providing 958 hours of volunteer service and collecting more than 9,300 items to benefit 66 organizations! $814,000 More than $814,000 donated to organizations throughout Liberty Bank’s footprint in 2017…and over $11 million since the Foundation’s inception in 1997! "Switching to Liberty Bank was a true pleasure. Moving to a dependable bank was worth a little extra work and Lisa took the stress out of the process, making us feel empowered while ensuring we got the best options for our financial situation." Back in 1979 James Vitali left the farming business to start his very own energy company in Wallingford, CT with only one truck and a multitude of hopes and dreams. Fast forward nearly 40 years to Meriden, CT. Today, Mr. Vitali’s family-run business has developed into more than just a dream come true. It has grown into an array of satellite companies with dozens of trucks and people on the road. Primarily, their business focuses on: safely and efficiently delivering oil and propane products to homes across the state, equipment service and installations, and topnotch customer service. Mr. Vitali’s long-time journey in the oil and propane business began as a result of his passion for helping local families keep their homes warm at a low cost. The glue that holds them together, today, Katie (Vitali) Childs and Jim Vitali, Jr. share ownership, running the many aspects and operations of the business along with their father. And one can’t forget Katie’s eight-year-old golden retriever, Boomer - a fan favorite in the office! As the original owner, Mr. Vitali feels incredibly fortunate to have a strong staff, both on the road and in the office; dedicated employees who believe in what they do and go the extra mile to help customers. The Vitali’s businesses continue to grow daily and strengthen over time. With operations mostly in Connecticut, they have tractor trailers traveling 24/7 across the state, 60,000 gallons of propane storage and rising, and 300,000 gallons of oil storage! They have even expanded into the real estate/property business, run mostly by Jim Vitali Jr., and operate a woman-owned Trucking/Transportation Company, something Katie is particularly proud of. Due to their plethora of trades, finding the right banking partner to allow them to confidently and smoothly run their businesses was not an easy feat for the Vitalis; that is, not until they landed at Liberty in 2017. Their strong partnership with the Bank has much to do with their relationship with Meriden Branch Manager, Lisa, who was given an opportunity (and ran with it!) to change their perceptions of the banking world after an unsettling experience at another financial institution. From day one, Lisa made the transition seamless, providing informed guidance along the way. In addition to their many business and personal accounts, the Vitali’s also partner with Liberty to offer their employees a tax-favored way to cover out-of-pocket health-care costs, through Health Savings Accounts, at no cost to them. Collaboration and working toward a shared purpose: the driving forces that lead to ultimate success. It goes without saying; these two key links make the relationship between Liberty and the Vitalis even stronger. Liberty Bank, also a Connecticut grown company, was chartered in 1825 and remains the oldest bank in the state. Similar in nature, Liberty knows what it takes to achieve lasting success through The Power of WE. Just like the Vitalis, Liberty emphasizes the importance of delivering exceptional customer experiences. We empower employees to make the right decisions… those in the best interests of our customers, focusing on ways to save our customers money, time and resources. We both also look at the big picture and are motivated by long-time goals that have a positive impact on everyone. This involves a commitment to volunteerism on boards and engagement around key community issues. "Right from the start, we knew Liberty was the perfect fit for us. It’s refreshing to connect with people on such a personal level in the Bank and feel comfortable talking to them about our finances. We enjoy all the interactions with the Meriden Branch staff, but Lisa really is the icing on the cake! We have the utmost respect for her team and the Bank as a whole." © Liberty Bank 2018. All Rights Reserved. Send money to anyone directly from your Liberty Bank account by email or text. From your dashboard navigate to the Send Money feature. Enter the name of the person you want to send money to then enter the payment amount and select which account you’d like to send your money from. You can also include a message to your recipient. Click the box to accept the terms, and select the email or text option. To send your money in an email, select Send via Email and fill in the recipient's email address as well as a security question that only your recipient can answer. Funds will be withdrawn from your account after your recipient has answered the security question and entered their account information to claim the payment. Payments claimed on a business day before 5:00 p.m. will be withdrawn that night and deposited into the recipient’s account within one business day. Payments claimed after 5:00 p.m., or on a weekend or holiday, will be withdrawn from your account the next business day and deposited into the recipient’s account on the second business day. To send your money in a text, select Send via SMS, and fill in the recipient's mobile number as well as a security question that only your recipient can answer. Just as with sending your cash in an email, the funds will be withdrawn from your account once your recipient answers the security question and enters their account information to claim the payment. If you have any questions, about Liberty Bank online banking please call our customer service center or send us a secure message any time. Under Transfers you can make transfers to your own accounts, to another Liberty Bank customer, and to or from your accounts at other financial institutions. Let’s start with doing a transfer from one of your Liberty Bank accounts to another one of your Liberty Bank accounts. Select the account from which you would like to transfer your funds. Then select the account you want to transfer your funds to. Enter the amount of funds you’d like to transfer, select a scheduling option. By selecting “immediate,” funds will be immediately debited. These transfers cannot be cancelled or stopped once submitted. Select “Future-Dated (One Time)” to schedule the transfer on the date you select. Recurring transfers can be set up on different schedules. Options include: daily, weekly, monthly or annually. You can also enter a description, which will display in a description field in the account activity area of your online banking. Now let’s do a transfer to another Liberty Bank account that isn’t yours. This is called Liberty2Liberty. Click here to set up that account. You’re all set. Now all you have to do is go back to Transfers, select where you want to transfer from, and then to. Then select your scheduling option, add a description and Submit. Lastly, let’s do a transfer to an account at another bank. This is called Bank2Bank. Click here to set up that account. You’re all set. Now all you have to do is go back to Transfers, select where you want to transfer from, and then to. Select your scheduling option, add a description, and Submit. Managing your Liberty Bank debit card is easy to do in your Liberty mobile app. Download our Liberty Bank app to your smartphone. Login … click the navigation link at the top left of the screen, and select Card Services from the list. Here, you can manage your profile settings by setting up which device you want to use as your primary device. You can also choose the email address where you’d like to receive notifications about your card. From the Card Services dashboard you can quickly freeze your card in case it’s lost or stolen. You can view your card transactions by date and by other filter options. Set up spending limits. You can set an alert for a specific transaction or you can deny transactions for a specific amount. Create alerts or block transactions under Merchant Type. For example, to disallow transactions for Gas Stations, toggle Gas Station to be blocked instead of allowed. Set up an alert or completely block certain transactions based on Transaction Type. For example, to disallow transactions for eCommerce items, toggle eCommerce to be blocked instead of allowed. In Denied Alert, you can choose to receive an alert for every denied transaction that occurs on your card. Turn on Alerts by region and customize safety zones or device requirements that require a specific device to be present at the merchant at the time of purchase. Here, you can also block or alert transactions outside of the United States. If you have questions about Card Controls, just contact Liberty Bank’s customer service center. Or send us a secure message. And don’t forget, if you’re traveling, make sure you send us a Travel Notification. It’s easy.